Chi Sau (also spelled Chi Sao) is a major tool in developing killer Wing Chun abilities. 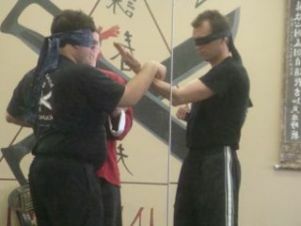 The two above are demonstrating 'blindfolded' Chi Sao. If you want lightening speed, hair trigger reflexes, or to 'mind read' your opponent, practice Chi Sau. It is so central to applying and mastering the principals of Wing Chun that its been referred as the jewel, the genius, or the heart of this martial art. It has also been called Wing Chun’s laboratory, since it lets students experiment with their techniques, discover what works for them, what doesn’t, and what to do about it. Stress technique over sheer force. But each has a different goal. Push hands trains you to feel your opponent’s center of gravity and disrupt it, by pushing, tripping, or throwing. Chi Sau could do that as well. But since Wing Chun is an art that unleashes explosive strikes, its objective, especially at the more advanced levels, is to find an opening to strike your opponent, while protecting your own openings from attack. Why is it Called Sticky Hands? Chi Sau (黏手 - in Mandarin's pinying it's pronounced Nian Shou) translates as sticky hands. Many people take the name literally and believe you must stick to your opponent’s arms at all costs. Not entirely accurate. You want to maintain contact at the forearm right behind the wrist. This area is called the bridge. More important than 'sticking' is protecting your center line from attack, and feeling when your partner's centerline is vulnerable to your attack. For instance, if your partner gets tired and drops her guard very low, instead of following it down by 'sticking' to it... you probably have an opening down the center. Let her arm drop, break contact with her bridge, and hit her in the face. Through sticky hands practice, you learn effective transitions, adjustments, and control of all three sides of the bridge. The bridge is the basis for the three families of Wing Chun hand movements. The fok (fok sau) movements use the middle of the bridge. Another point about the name: If both opponents [look at the picture above] have good form (assuming there is no footwork in the drill), and protecting their centerlines and the centerline between them, technically that means both their arms/bridges are taking up the center. But according to Newton or Einstein (probably both), and often repeated in Wing Chun, two objects can't occupy the same space at the same time. So visually, the arms are rotating in a Wing Chun chess match where each opponent is trying to gain a better position. To the untrained eye this looks like the fighters are trying to stick their arms together. In fact, what they are doing is probing for openings, attacking the openings, simultaneously creating an opening on themselves with their attack, and then defending the openings from their opponent. Back and forth this goes until something gives. Touch Sensitivity - When you have contact, your hands, arms, and eventually the rest of you learns to read micro-movements from your opponent. This tells you their balance, position, intentions, flexibility, and prepares you to respond. Rapid-fire Contact Reflexes - Muscle reflexes are much faster than the eye, especially at close exchange range where your opponent is simply a blur. Chi Sau (and Chi Gerk, similar but with the legs) develops muscle memory; neuro-muscular programming. Instead of waiting to see a partner’s next move, you can sense it and react automatically. Trapping - This technique lets you use one of your hand to control both of your partner’s hands, leaving your remaining hand free to attack. This drill is a great way to develop and prefect trapping skills. Footwork or no-footwork - Without using footwork allows you to focus on only the arm movement. What's nice is that it also forces you to properly use your hips and shoulders. But when you do add in footwork the dynamic changes entirely. Initially though, you want to practice Chi Sau without footwork to become proficient in the arm moves, then you can add in the feet. Predetermined or random - In our kwoon, we have a set standard of moves for these drills. This is what we mean by 'pre-determined'. It allows you to practice the same moves over and over again until you are comfortable (practice one move 10,000 times…). 'Random' starts out as regular Chi Sao, but evolves from there and often turns into light sparring. One arm or two arm - Most Chi Sau videos you see online demonstrate the opponents using two arms that same time. That's the ultimate goal. But when you first start out that can be very confusing. Training one arm at a time, first, is helpful. Also, in our school we train cross-arm (right arm vs. right arm, while facing each other); this can only be done using one arm. Alone or with a partner - During class we almost always do Chi Sau with a partner. But I find practicing at home, alone, and in front of a mirror helps you better see your arms in relation to your centerline (is it covered while you rotate, or not?). It's a powerful way to isolate the moves and perfect them. I don't think you can get that kind of clear feedback with a partner, because there's just too much 'data' and interference coming from your partner. Lastly, if you're very new, you simply stand face to face with your opponent, in a neutral stance, no footwork, hands out to the side a bit, and push on each other's hands. The object is to push the other person off balance, while not losing your own.